Discover the unique underwater world of the East Mediterranean while sailing from one diving site to another! Combine a sailing and diving adventure around the Cyclades Islands and explore shipwrecks, cliffs, caves and the spectacular biodiversity of the Greek waters. 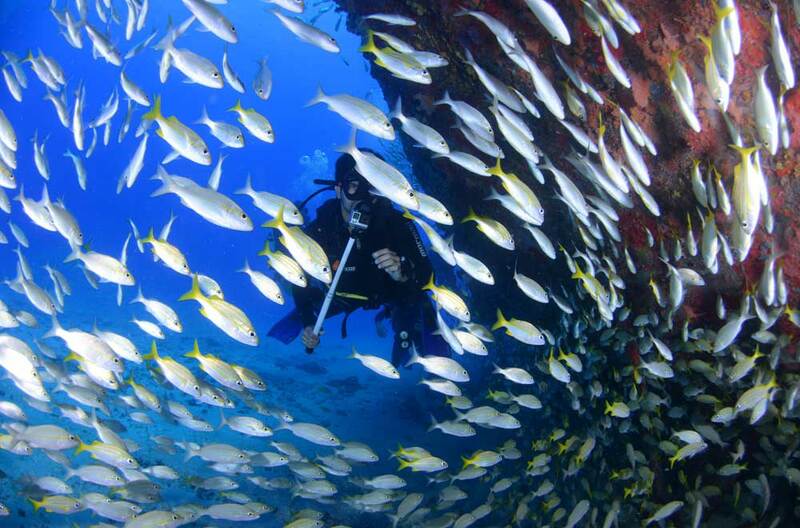 If you love diving and you are passionate about nature, then these sailing & diving holidays are ideal for you. You can join on your own or with friends from April till November. The yacht can comfortably accommodate up to 5 divers/6 guests. Before our dives the experienced and trained crew will make a presentation on the wonders of biodiversity and marine ecology. We will meet at 17.00pm at Syros. Briefing and arrangement of provisions. Visit and explore the historical coastal town of picturesque Ermoupolis and welcome supper at one of our favorite taverns. 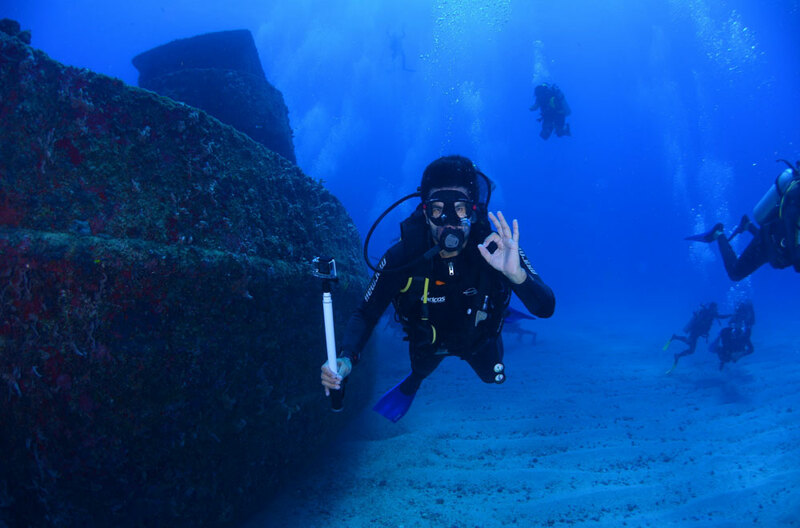 Start the day with a dive at an ancient wreck within Finikas bay. You can still see the broken amphoras and the life that hides in them. Sail towards the deserted island of Despotiko near Antiparos where we will anchor for the night. Visit the Chora (main village) and enjoy supper at one of the best fish taverns in the Aegean. Short sail to the deserted little islands of Pantieronisia where we will stop for a dive in a cavern. We will anchor at one of their protected bays for a swim and lunch. Sail towards the island of Iraklia in the Small Cyclades. Home-made supper prepared by Mrs Maria at the picturesque main village. Dive at a 2nd World War plane wreck at the bay of Alimia. Sail towards the pirate island of Amorgos. Stop on the way at the bay of Nikouria for a swim and lunch. Enjoy supper at one of the unspoilt villages surrounding the bay of Aegiali. Short sail towards the deserted islands of Dryma and Antikeri where we will spend the night on the anchor. Dive at one of the most beautiful and colorful caverns at Dryma. Barbecue on the small beach that is formed between these two islands. Short sail towards an islet off Koufonisia where you will experience a lively reef dive. Sail towards the island of Kato Koufonisia, known for the crystal clear turquoise waters. Supper at the tavern of the only family that lives on the island. Sail towards the fishing port of PisoLivadi and the island of Paros. Stop on the way for a swim and lunch. Visit the traditional village of Prodromos and enjoy supper at one of the local taverns. Please note that all itineraries are subject to changes due to weather conditions. We will meet at the fishing port of PisoLivadi at 17.00pm. Briefing and arrangement of provisions. Visit at the picturesque village of Prodromos and supper at one of the best taverns of the island. Start the day with a dive at the shipwreck of Marianna between the islands of Paros and Naxos. Sail towards thedeserted islandof Despotiko near Antiparos where we will spend the night on the anchor. Visit the Chora (main village) and then enjoy supper at one of the best fish taverns in the Aegean. Short sail to the deserted little islands of Pantieronisia where we will stop for a dive in a cavern. We will anchor at one of their protected bays for a swim and lunch. Sail towards the island of Folegandros. Visit and supper at one of the most beautiful Choras in the Cyclades. We start the day with a cavern dive. We will then sail towards the island of Sifnos stopping on the way at a secluded bay for a swim and lunch. Visit in the evening at the famous medieval Kastro settlement to watch the sunset and have supper. Stop on the way for a swim and lunch at one of Kimolos’ isolated bays. 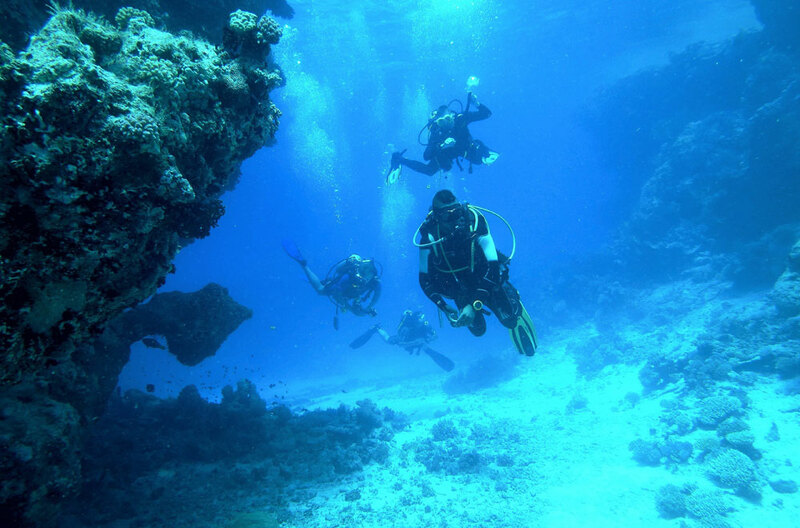 Dive at one of our favorite diving sites, off a rocky islet in the Kimolos-Milos channel. Spend the night at the little fishing port of Kimolos and visit its picturesque main village. Dive at the deserted island of Polyegos, an area where the Mediterranean Monk Seal Monahusmonahus lives. Spend the night on the anchor at a remote bay and enjoy at night a barbecue on the beach. Enjoy the day sailing around the island of Milos. Stop on the way at one of its stunning bays for a swim and lunch. Supper and live music at the main village.